Music director Gustavo Dudamel and the Los Angeles Philharmonic presented a triumphant performance of Mahler’s Ninth Symphony at Benaroya Hall on Nov. 4. The Los Angeles Philharmonic and music director Gustavo Dudamel arrived in Benaroya Hall on Friday evening for a concert that underscored the glowing reputation of their partnership. The program, Mahler’s massive and tragic Ninth Symphony, displayed what a virtuoso orchestra can achieve in the hands of a great conductor. A vast musical kaleidoscope that ranges from halting despair to furious intensity, the complicated Ninth is a challenge for any conductor; Dudamel conducts it without a score, a prodigious feat of memory. Watching him cajole, command, and beseech great performances out of his players makes it clear that this is a rare and brilliant musical relationship. Many commentators have discussed the ways in which the Ninth is a symphony about death: the halting phrases that sound like Mahler’s own ailing heartbeat, and the attenuated dying-away notes in the finale — with Mahler’s own indication in the last bar of the score, “ersterbend” (dying). Yet Dudamel’s reading of the score is no mere death knell, but a vision that encompasses boisterous and triumphant life as well. He can make that big orchestra into a flexible and fleet troupe that turns its phrases on a dime, from exuberant to demonic in a twinkling, and back down to the merest whisper of sound. In the Mahler Ninth, there’s frequently so much going on in the orchestra that a conductor must work hard for clarity. Nothing ever sounded muddy, though, even in the score’s most densely constructed moments. Now in his eighth season with the LA Philharmonic, Dudamel made his initial reputation as a wildly exuberant maestro; while he’s still fun to watch, his movements and his baton choreography are more restrained. What is still obvious is Dudamel’s close communication with his players, particularly in the glorious, hymnlike fourth movement, where he let them linger over the rich melodies. 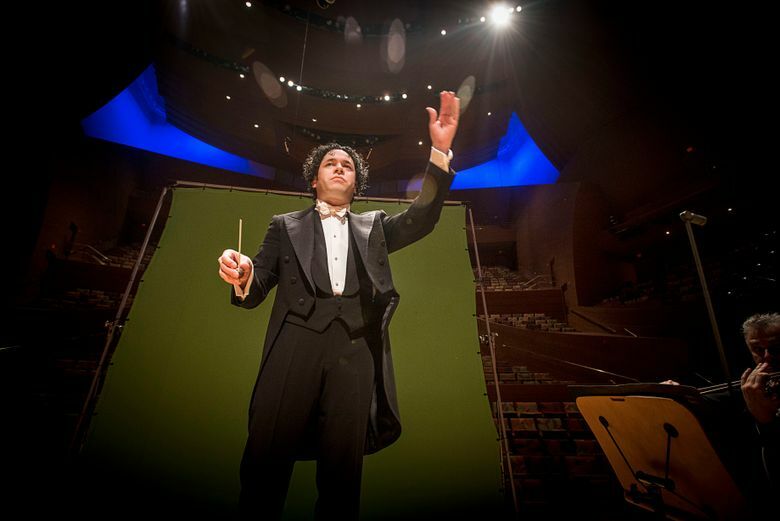 When the last faint phrases of the Ninth died slowly away like the ebbing of life, Dudamel sustained the bridge between almost-silence and real silence — keeping his hands raised (and keeping the audience silent) for many long seconds before finally lowering the hands. The applause was tumultuous, as the conductor moved among his players to recognize them section by section, while the appreciative audience roared at football-stadium volume levels. Dudamel’s well-deserved pride in every single player was endearingly obvious.